RT:It's thought that American investigators were looking for a potentially dangerous government leak - so wasn't this justified in terms of national security? Tony Gosling: Due to the timing of these two months of telephone information that they’ve taken [from] over twenty phone lines, [it looks as if it was connected with] what is effectively war crimes by the CIA over in Yemen. The CIA’s view and the American military’s view is that there are all sorts of crimes going on by the Yemenis and the Associated Press had been exposing them. Actually, what’s been going on here in reality is that the Associated Press were exposing war crimes by people in their own country. What we’ve got here squaring up is the American military industrial complex, led in this case by the US attorney general Eric Holder. He is some kind of devil’s advocate; if you remember the film, he is that kind of a lawyer. He’s the first ever in American history to be held in contempt of Congress, so he has certainly not got his hands clean. On the other side is the tradition of a free press, and the effect of this massive trawl, effectively a fishing operation of months of AP telephone lines, is it has a horrific chilling effect on journalism. It also means that individuals, whistleblowers and people with stories can no longer trust the journalists. If they go with confidential information to those journalists and have confidential phone conversations, they are no longer guaranteed that those journalists can keep those conversations secret because the Justice Department is coming in with a massive trawl over a two-month period. One can understand if it’s a small investigation over a couple of days or a particular phone line possibly, but this is a fishing operation and an appalling attack on the freedom of the press in America by a government that is out of control. RT:Can journalists really be trusted - doesn't the phone hacking scandal in the UK suggest otherwise? TG: I don’t think that the situation in Britain is quiet as difficult as it is over in the US at the moment. They are going to the line it seems with operations like this. 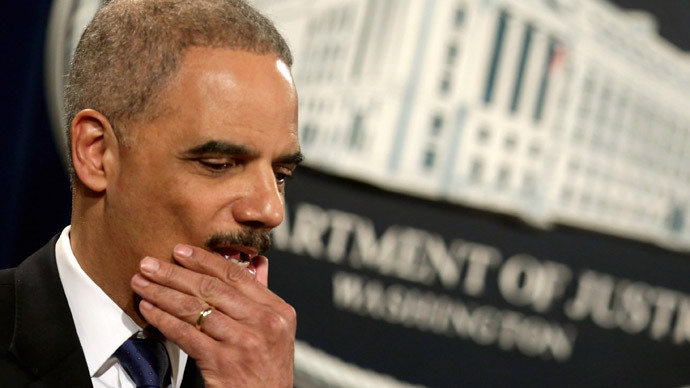 What is effectively going on is that Eric Holder, who is a puppy-dog; he’s not really sticking up for the American people, he’s not doing his job. What he is doing is the job of the American military industrial complex, which is very frightened about actually being exposed by people like the Associated Press for the things that they are doing. We do have problems here in Britain, but it’s not quite as bad as in the US. Journalists and lawyers have to really watch out for governments that snoop on their information and have to stop it, stone dead. RT:AP has managed to put the Obama administration in a very embarrassing situation by exposing this surveillance web - so is this case ultimately a victory for the press? TG: Of course this does have to be exposed, but like I say, there is nothing that is going to stop this chilling effect, which is making it very difficult for journalists to keep their sources private. In this kind of situation, where the Justice Departments gets its hands on all those phone calls, that’s almost impossible. And of course, this is all is driven by the military industrial complex who have their eyes on the Middle East oil and the Yemini oil. This has nothing to do with trying to stop terrorism or anything like that. These are just those that are trying to stop the US from taking over oil deposits in the Middle East and effectively covering up for what is actually illegal activity. RT:If governments are worried about information being leaked by journalists, shouldn't they be focusing on finding the source of that leak within their own ranks - rather than targeting the messenger? TG: You should never be targeting the messenger. The messengers are coming up with bad news and those in authority in the US don’t like it. It’s a similar situation in the UK. We have secret courts being brought in here in Britain. And ultimately this is the rise of a kind of police state where government thinks it can do what it wants. What we’re seeing is the erosion of some of the basic civil liberties that we’ve said for the last 30-40 years: ‘this is what we hold dear.’ We’re saying that ‘oh, these terrible Al-Qaeda and etc. are trying to take those civil liberties away’. But Al-Qaeda aren’t taking them away, our own governments are taking them away. Christopher Chambers, journalism professor from Georgetown University in the US, believes the reason behind the Justice Department investigation of AP is the government’s desire to have control over the flow of information covering it up by public safety concerns. “Especially when they perceive, rightly or wrongly that they are protecting the public from terrorism or some external threat or perhaps some internal threat. The problem is that that threat has not been articulated, has not been put out there as something that overrides this unprecedented intrusion,” he told RT.